Register now, and put an extra dose of fun in your computer! 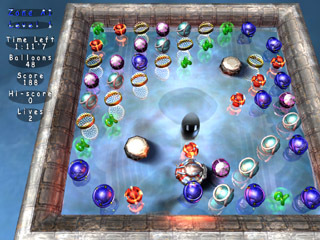 There are more than 100 varied and amazing levels through 4 game modes to challenge your mind and reflexes! To get the full version, you just need to register for only US$9.95. You will receive a key which will allow you to unlock your demo version so you can enjoy all of the game's features. If you don't receive your key quickly, check that your anti-spam program didn't stop it: the subject of the email is "BALLOONrain - License Key". If you order with Paypal or by check, and if you're not satisfied with BALLOONrain just let us know why and you'll receive a prompt full refund. If you order with BmtMicro, you still have a 45-day risk-free guarantee, but a $3 (or 3€) processing fee will be deducted to achieve the refund. We have chosen BMT Micro to process your orders due to their high-level attention to customers' security needs and extensive support. They are available by email to answer any queries about order security. Mana Games does not receive sensitive information from BMT Micro regarding customer details, i.e. credit card numbers.